If these last four years have taught me anything, it’s this – you have to find your something. Light Totem got so much attention that nobody could take it down. 'The Walking Dead' Grade: D+ Let me clear my throat for this one. Hang on. The totem returned in June after 15 months away. On a misty Saturday morning, the scalper stands at his corner, the stadium looming behind him. He’s right at the edge. Scalping tickets at IU football games is not easy. 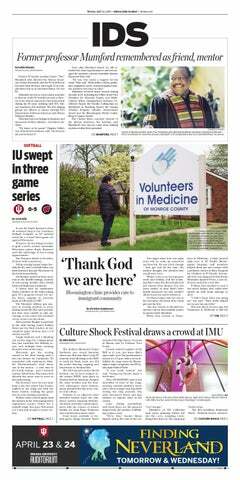 IU's season came to a close Friday night. IU needs to play better against bad teams. Column: What is IU's defensive identity? IU needs to be a man-to-man team. This IU team is about as modern as you can get on the basketball court. What will Tom Crean do with Robinson? The last time IU played Nebraska, the Hoosiers lost in three sets and weren’t competitive. The most interesting thing came after the game was played. It will be a homecoming of sorts. The number was high, but that should worry IU fans. IU will play Rutgers tonight, who is 0-14 in the Big Ten. UIndy had an alarming 22 offensive rebounds. IU had nine. While growing up, Sherry wanted to play basketball.